Announced at this years's San Diego Comic Con, Rabid is one of David Cronnenberg's earliest films. The blu-ray, from Scream Factory, will hit shelves on November 22nd, 2016. 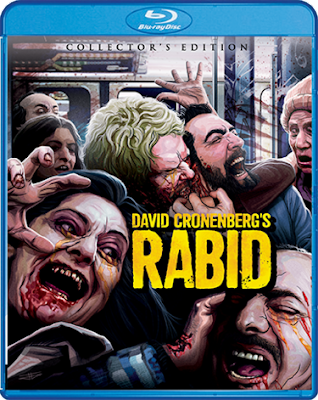 With Rabid, acclaimed director David Cronenberg (The Fly, Dead Ringers, Naked Lunch) delivers a high-tension thriller filled with "zombified sluts and shock moments… an irresistible combination that Cronenberg handles well" (Almar Haflidason, BBC)! After undergoing radical emergency surgery, Rose (former adult film star Marilyn Chambers in her first leading role in a mainstream film) develops an insatiable desire for blood. She searches out victims to satisfy her incurable craving, infecting them with an unknown disease which in turn swiftly drives them insane… and makes them equally bloodthirsty. Follow the lovely but deadly Rose through her terrifying ordeal as victim by victim, the spreading circle of casualties grows... until no one can escape their grisly fate of becoming... Rabid.